Boat cockpit covers extend from your boat’s windshield all the way to the back, or aft area, of the boat. A good cockpit cover snaps down tight to the sides of your boat. It protects your driver’s station, onboard electronics, seating, and the largest area of your boat from wind, rain, and other brutal elements. If your cockpit enclosure wears out or is damaged, you might find a temporary solution at your nearest marine store or even an online retailer, but it’ll never do the job as well as the original cockpit cover that was form fitted, specifically, for your boat. 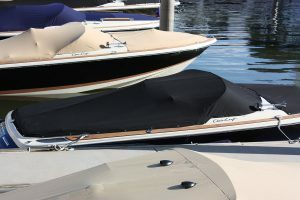 Depending on the make and model, AmeritexDirect can supply a clone of your original cockpit cover that’s the exact shape and dimensions needed to protect your boat and keep out water and other elements. Your replacement cover will be custom sewn in our leading-edge facility to the exact same specifications as your original cockpit cover and shipped ready for installation. Find out if we offer a cockpit cover for your boat here. Your boat’s new cockpit cover will not be an approximate fitting aftermarket solution, but an exact replica of the original made for your boat and a surprisingly affordable investment that you will be glad you made.